Sandy Haight has been focused on painting the inner landscape of flowers for the last few years. She calls these works Floralscapes. They evolved during a transition from a career as a commercial illustrator to a discovery of herself as an artist. Teaching watercolor to students at Bellevue College near Seatttle, helped redirect her focus as she explored the various subjects and techniques of representational watercolor before realizing that immersing into the shapes, designs and patterns inside flowers and plant life was the subject that awakened her love of painting and gave her a chance to create a series of stunning beauty. Building layers of intense colors helped brighten the way through the dark and gray of northwest winters. Showing her paintings in the Northwest Watercolor Society’s juried shows qualified her to become a signature member in 2012. The initials NWWS now follow her signature on the Floralscape paintings. Sandy now lives on Bainbridge Island, a short ferry ride from downtown Seattle, WA. Use of watercolor in her illustration work became part of her signature style. To be more widely marketable and contemporary her illustration style departed from the realism she had worked hard to master as a student into a more simplified bolder look. Now as a teacher, she’s rediscovering the joys of building a nuanced painting, rich with built up layers of color and texture as she launches her students into the same process of art making. As she makes more time for painting flowers in depth, Sandy’s life drawing practice has taken a back seat. The flowers are blooming forth and all consuming. She had the honor of having her painting "Reaching" selected as the poster image for the 2015 Bainbridge In Bloom, an annual garden tour for Bainbridge Island, and also painting the Skagit Valley Tulip Festival poster for 2016. 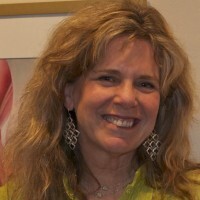 You can see Sandy's Floralscapes and other watercolors and sumi art on her fine art web site: www.sandyhaightfineart.com.